Laurence Stephen Lowry was born on the 1st of November 1887 in Stretford, Manchester, to middle-class parents. He was to become one of Britain's most popular 20th Century artists, and it is believed that he executed about 1,000 paintings, and over 8,000 drawings during his lifetime. An artistic 'outsider', he developed an interest in the urban and industrial landscape, and its people, making a unique contribution to recording the environment and culture of the industrial North West of England, with many of his paintings depicting Pendlebury, where he lived for many years, and Salford, and surrounding areas. Lowry's paintings and drawings need no introduction, as his distinctive style is immediately recognisable. He is best known for his panoramic vistas of industrial towns and his street scenes with figures, but he also painted other subjects such as family groups, harbours and beaches, children, animals, portraits, and sports meetings - the subjects Lowry chose are more diverse than many people realise. 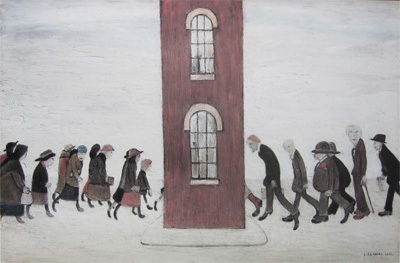 Almost every Lowry painting is populated with human figures - the people Lowry saw around him in his day to day life, all depicted in his distinctive naïve, primitive style - his figures popularly characterised as "matchstick men". The 'simplicity' of Lowry's best known work belies his genuine artistic talent. As many of his early works demonstrate - such as his portrait of his mother, and his self portrait, he was a skilled artist and fine draughtsman. He attended private painting classes at age 16, and from 1905-1915 took evening classes in drawing and painting at the Manchester Municipal College of Art, studying under Adolphe Valette. From 1915-1925 he attended Salford School of Art, and this period saw him establish his style and subject matter. In 1930, Lowry's painting 'An Accident' was purchased by the City Art Gallery, Manchester - the first publicly acquired Lowry work. The same qualities that made Lowry popular caused him to be less seriously celebrated by the artistic establishment. Nevertheless, he exhibited over 80 works at the Royal Academy from 1932 onwards, and was elected a full member quite late in his career in 1962. Lowry exhibited over 60 works at the Royal Society of British Artists from 1933-1946, with prices ranging from £6-6-0 to £250-0-0 for the painting listed as 'The Regatta'. He also exhibited with The New English Art Club from 1927-1936, and occasionally thereafter until 1957. He exhibited work early in his career at the Manchester Academy of Fine Art, and with The Manchester Society of Modern Painters, and at the Paris Salon d'Automne. In 1939 his first one-man exhibition at the Lefevre Gallery in London was held, and from 1943 exhibitions were held at the same gallery at yearly intervals until 1976. In 1952 he exhibited at the Crane Gallery in Manchester - the first commercial gallery outside London to show Lowry's work. Many other one man exhibitions were held during Lowry's lifetime, and several more have been held since his death. In 1961 he received an Honorary Degree from the University of Manchester, and in 1965 he received the Freedom of the City of Salford. The GPO issued a stamp celebrating the artist's work in 1967, while in 1975 he received Honorary Degrees from the University of Salford and the University of Liverpool. Lowry refused a number of national honours between 1955 and 1976, as he did not wish to change his situation by having something applied to him. He turned down the offer of an OBE in 1955, a CBE in 1961, and a Knighthood in 1968. He also turned down the offer of a place in the Order of the Companions of Honour in 1972, and again in 1976. An interesting footnote to Lowry's accomplishments as an artist is the fact that he held down a regular job for much of his life, beginning his working career as an office clerk, before being employed as a rent collector for the Pall Mall Property Co., Manchester. By the time he retired from the company in 1952, he had risen to the position of Chief Cashier. His regular job led to some critics disparaging Lowry as a "Sunday painter", a charge which he countered by saying "If people call me a Sunday painter, I'm a Sunday painter who paints every day the week." Lowry's work continues to be appreciated today, and he has received more acclaim in the years since his death, including the naming of the theatre and art gallery on Salford Quays as 'The Lowry'. A selection of the large collection of over 350 Lowry works held by Salford City Council is on permanent display there. A major exhibition titled 'Lowry and the Painting of Modern Life' was held at the Tate Britain in London in 2013. 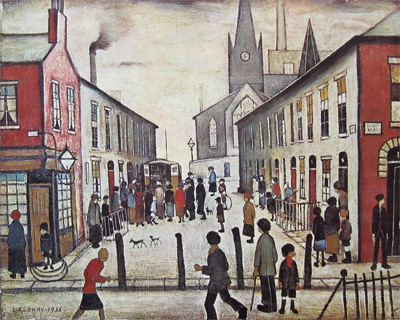 It featured Lowry’s urban scenes and industrial landscapes, and was curated to demonstrate that Lowry provided an account in paint of the "experiences of the 20th-century working class" and that "his dominant status in British art coincided with a disappearance of the industrialised world he engaged with".